On Wednesday Microsoft released its Windows 8 Consumer Preview to the general public following an introductory event at this years Mobile World Conference. This is the second preview of Windows 8 that Microsoft has let into the wild wilderness of the internet. We looked at the Developer Preview back in September, so if you’re looking for a breakdown of the major UI changes to Windows head to that article. Today we’re going to be look at the changes between the Developer Preview and the new Consumer Preview and a few other thing worth mentioning. One of the changes that you’ll notice immediately when working with the Consumer Preview is that the Windows 8 start page just looks better. Windows 8 is really continuing down the path that Microsoft has set out for itself with each pervious iteration of its flagship OS. The two tenets of this path are UI simplification and background process abstraction. By this I mean that Metro is really designed to be more intuitive to someone who has no idea what they’re doing, while at the same hiding the nuts and bolts of what makes Windows work. Now this is both a benefit to Microsoft and an Achilles heel. If you use your PC mostly for Facebook or Reddit machine Windows 8 will, almost without question, be an improvement to your user experience. But if you’re a heavy user who does content creation, rather than content consumption, you’re going to find that Windows 8 will take some adjusting to. Now many people who love the Windows 7 desktop environment see the lack of a start button and the peculiarities of the Metro interface as big strikes against Windows 8. But in practice the efficiency of photo editing or research paper writing in Windows 8 is at the least equal to that of Windows 7. The catch is that you have to change the way that you move through your work flow. This is where the Charms come into play. into your PC. Whether you need to safely eject a USB drive or connect your laptop to a secondary monitor the Devices Charm is where you’ll go. Last we have the Settings Charm, this is basically a stripped down version of the control panel. It allows you to access most if not all of the settings on your PC that you might change on a daily basis, like screen brightness, power states, and Wi-Fi networks. 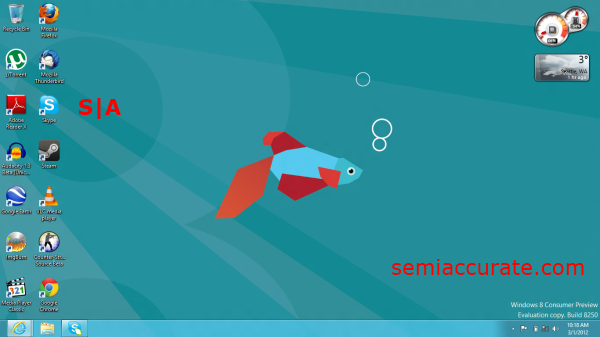 Integrating the Charms into your workflows is going to be the key to your transition into Windows 8. Having captured and edited all of the images for this article inside Windows 8, I can say from experience that once you get into the new workflow patterns by using the Metro start panel and the Charms, Windows 8 is at least equal, if not more efficient compared to Windows 7 in terms of getting what you want done quickly. And in that regard I’ve come away impressed by Microsoft’s reimagining of the Windows experience. One of the major criticisms of Windows Vista, 7, and XP to some extent was their reliance on internet connectivity for functionality. This increasing reliance on the web has grown unabated in Windows 8. Almost every Metro app uses data from the web for whatever reason. This is really reflective of the way people use their PCs these days. We are always connected to the internet, and we are often doing something online. Thus it makes sense that Windows 8 environment operates under the premise that the cloud, and web based applications are the way of the future. But enough about the UI, let’s get to what you really care about, backwards compatibility and performance. Almost all of the applications I tried worked in windows 8 flawlessly, granted they seemed a little bit out of place in the Metro world, but they almost all worked. The only major exception to this was when indulged my curiosity and asked, but can it play Crysis? And the quick answer to that question is no; or at least not on AMD’s Brazos platform. Despite multiple attempts at playing with launch options and compatibility settings Crysis would only go full screen, display blackness and then crash within ten seconds; tragic. I initially used AMD’s 12.2 Preview drivers on the test platform. They seemed to work well enough, but the control panel was basically useless, as most if not all of the settings tabs were disabled. Luckily, AMD later released a driver set specifically for this Windows 8 build. After installing the new set of drivers much of the missing functionality from the control panel was restored. With that out of the way I loaded up my applications and tried to evaluate what the performance story of Windows 8. The Developer Preview offered some minor increases in application performance, but nothing much greater than ten percent in my benchmarks. This Consumer Preview though, takes the bar up another notch. Counter Strike: Source is an older DirectX 9 game that is pretty representative of most Source engine based games like Half-Life 2 or Team Fortress 2. On Windows 7 SP1 using the exact same hardware the game ran at ~29 frames per second. Using the old Developer Preview build of Windows 8 the game ran at ~30 frames per second, and with the new Consumer Preview build the game runs at an astonishing 37 frames per second. We went from CS:S being mostly playable, to being completely playable, at the game’s maximum settings with 16x Anisotropic Filtering and 4x Multi-Sample Anti-Aliasing on. When we ran Cinebench on the Developer Preview we found performance to be mixed bag back in September. In OpenGL Windows 8 offered 69 percent of the performance of Windows 7, but the CPU benchmark was nine percent faster than in Windows 7. The Consumer Preview on the other hand offered a two percent advantage in OpenGL and a three and one half percent advantage in CPU. This is a significant turn around for performance in this application. No doubt Microsoft took sometime to trouble shoot the poor results that most reviewers were getting with this benchmark. wPrime was marginally faster on the Windows 8 Developer Preview build than it was on Windows 7, but the Consumer Preview yet again raises the bar by offering a six percent advantage in the 32M test and a three and one half percentage lead in the 1024M test, over Windows 7. All in all Windows 8 is shaping up to be at least marginally, if not significantly faster than Windows 7 on comparable platforms. Our last benchmark is ComputeMark. Now we had some trouble with our test results in the Developer Preview. Which is why I’m pleased to inform you that ComputeMark fairs better in the Consumer Preview, now only the Extreme test preset gives back nonsensically high results. But based on the results for the Normal and Complex tests it seems that AMD’s Windows 8 drivers aren’t quite at the same point in the optimization curve as their Windows 7 drivers. Admittedly this is a preview, and some driver issues are to be expected, but considering how small the gap is between the two OSes in this benchmark I think AMD’s driver team has giving us a respectable showing. 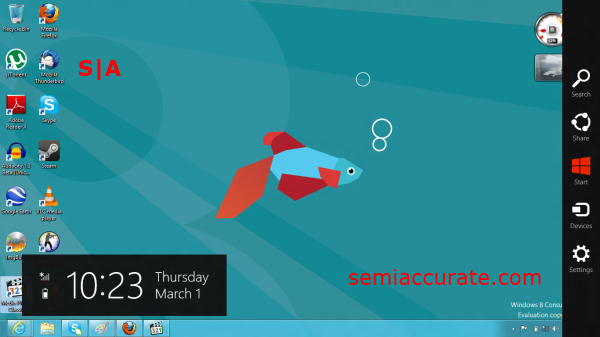 So is Windows 8 a big change from the more familiar waters of XP and 7? Oh yeah. 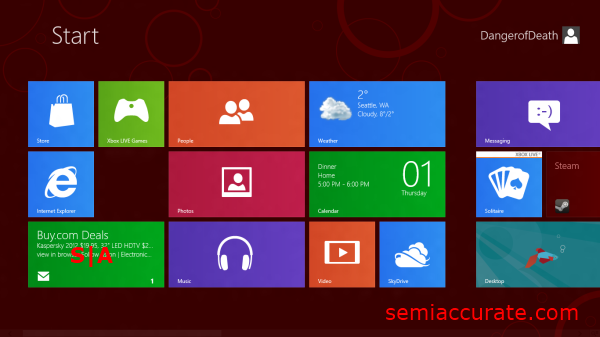 Windows 8 is more friendly to people that are comfortable with using touch screen devices. But if you are stuck with a mouse and keyboard Windows 8 can still effectively serve your needs. There is a period of adjustment when you make the switch from Windows 7 to Windows 8, but at this point I can confidently say that my testing platform, the X120e, is a superior tool when it’s running Windows 8. As far as the differences between the old Developer Preview and the new Consumer Preview go Windows 8 has certainly become more polished with time. Microsoft noted that 100,000 changes had been made to Windows 8 since the Developer Preview, and while that seems like a lot, considering the new level of polish that Windows 8 has I wouldn’t be surprised if they did really make 100,000 changes since September.